Order must be collected between 11h00 and 15h00 on the day of the delivery. The delivery fee will be R50 per delivery with the N1 – Northumberland – Witkoppen, N3 and M2 “circle” – called the R50 Delivery Zone. 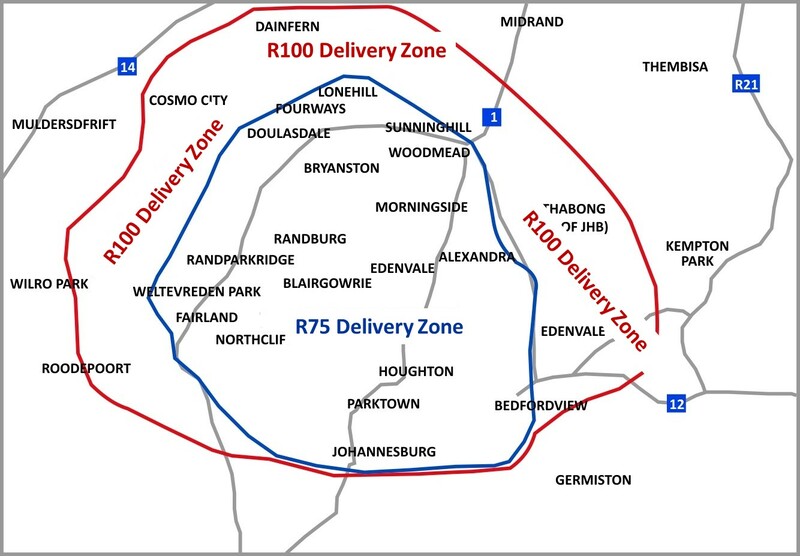 A R75 delivery fee will be charged for all deliveries within approx 10km of this circle and as marked as R75 Delivery Zone on the map below. Any order of R3 000 or more within the R50 delivery zone receive a FREE delivery. All other deliveries outside of these Zones will be quoted for on request. Delivery address must be a physical address and NOT a postal address! Please notify me of new products and future promotions. Items marked with a star(*) are required!